A couple of truly beautiful Cols in the Swiss “Vaudoise” Alps. 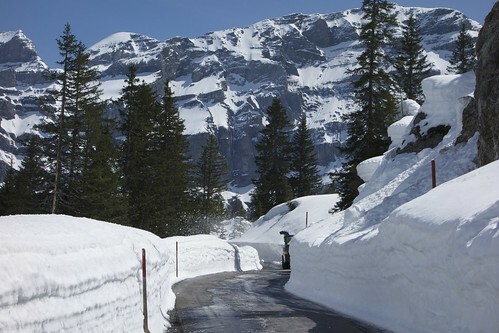 Usually the road up to Col de la Croix is closed until late May but it had been ploughed in preparation for next weeks Tour de Romandie stage race. 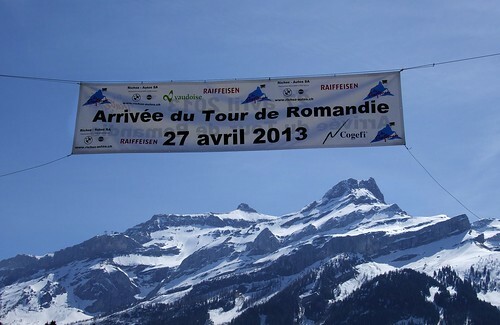 The Romandie “queen” stage will climb both sides on April 27th. So warm weather, snow walls, and big mountains made for some dream cycling. As the map below shows, I started in beautiful Aigle, climbed to Diablerets ski station, then up to Col du Pillon, back to Diablerets, then up to Col de la Croix, then down to Aigle. 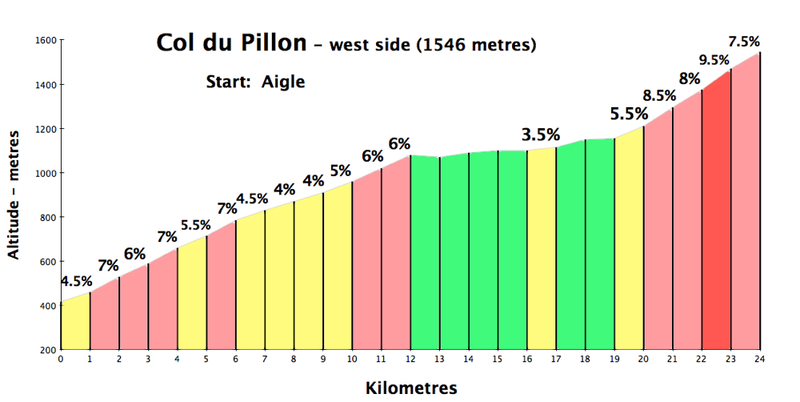 The other side of Col du Pillon is the second of three climbs in the Gruyère Cycling Tour – details here. 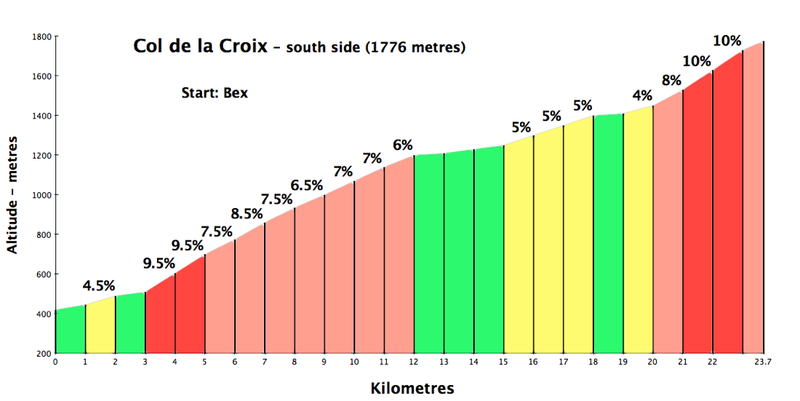 Romandie will climb both the north side of of Col de la Croix (from Diablerets) and the south side (from Bex). If you get the chance, it will be a fun place to watch a pro peloton pass twice. I *might* be there. 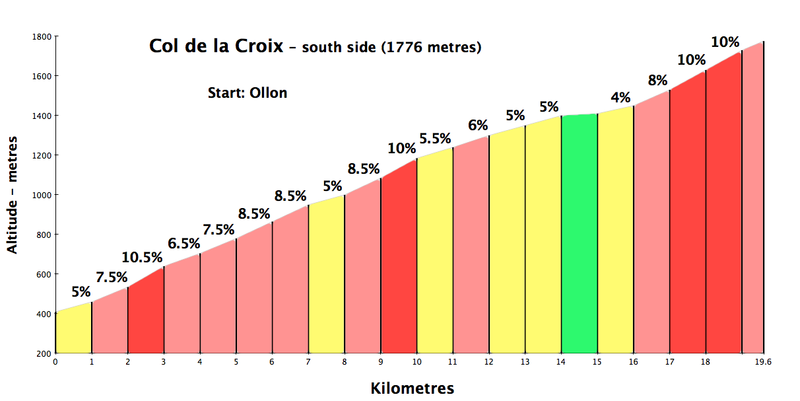 For some great Mountain Biking that includes Col de la Croix see here. Two nice climbs that run along the edge of beautiful high Alps. Merci beaucoup for producing and updating this incredibly helpful website. Your climb descriptions, profiles, photos and maps (along with the Tour de France) inspired two cycling trips to the French Alps and Pyrenees. From 12 – 16 May, I will be based in Geneva, and would like to attempt some (or all) of the climbs listed below (weather permitting); however, I am unable to find a definitive source of information on road closures/openings. 1. Do you know if these climbs are currently open to cyclists, even if closed to car traffic (i.e., if closed to car traffic, then park the car at the base and ascend/descend on bike) / Can you recommend a website(s) with current information on road closures/openings? 3. Are there other climbs that you would recommend, either in addition to or in place of those listed below given 4 days in Geneva and 4 days in Interlaken? 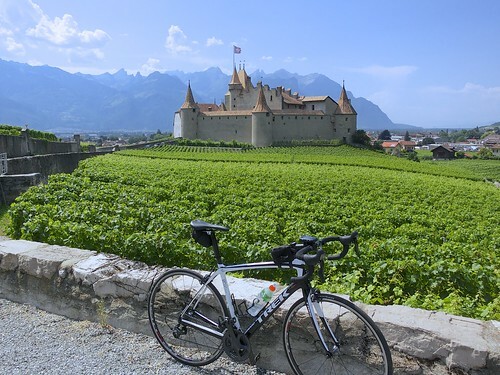 Would any of these make your Top 10 list for day-trip climbs near Geneva and Interlaken? a. Mont Revard, b. Le Semnoz, c. Col de Tamié, d. Col de la Croix Fry, e. Col de Joux Plane, f. Pierre Carrée, g. Colombiere and h. Col de la Croix (Swiss). From 17 – 20 May, I will be based in Interlaken, and would like to climb: i. Grimsel Pass, j. Furka, k. Nufenen, l. Gotthard and m. Grosse Scheidegg. Thank you for your time and advice (I realize that this is a lengthy list). From your list, definitely open and fine on road bike: Revard, Tamié, Croix Fry (u should combine it with Aravis), Pierre Carrée. If planning on going to Annecy to do Tamié then consider instead or also Col de la Forclaz de Montmin loop with Col de l’Epine. Joux Plane and Colombiere will likely but not definitely be closed … although you could get within 3 kms of either side of Colombiere, and the famous Samoen side of Joux Plane is probably possible with Mtb and possibly road bike even if listed as closed (Morzine side may take a while to open). Keep checking the official links above. Col de la Croix should be open, although possibly officially listed as closed. 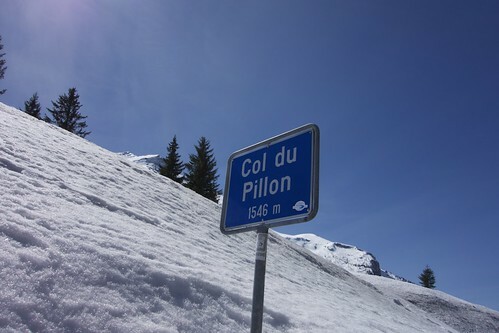 Col du Pillon definitely open. 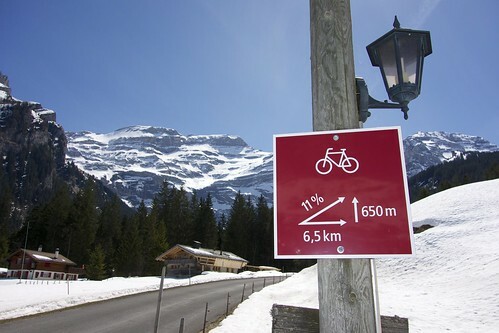 Unfortunately, I expect that all your Interlaken climbs will be closed. It’s just too soon. However, you could get up a long way on all of them. I don’t have anything on it on my web site, but there are some climbs on the north side of Interlaken that might be open, but I am no expert there. Other ideas very close to Geneva? I’d encourage you to climb Mont Salève just to the south-west. Recently listed in Le cycle as one of 50 most beautiful climbs (and my home climb). Also the Vallée verte cols (search on my site) are very nice, not too high and nearby. WIth the exception of Col de la Faucille, all the nearby Jura climbs are very quiet and nice. Thank you for making the time to respond to my many questions (which have probably been asked of you countless times – apologies for not reviewing your site more thoroughly and noting the “Alps Cycling FAQ” link). Your suggestions, words of wisdom and detailed information have saved me from hours of frustration on French and Swiss roads; and more importantly, provided me with the best opportunity to efficiently tackle the greatest number of classic cols and hidden gems of the Alps during my brief sojourn in Europe. The notes about Le Salève (4km stretch at 12%, only 25 minutes from Geneva – superb! ), the nearby Jura rides and the reminder to climb Aravis and Merdassier with the Croix Fry are particularly helpful. You are extremely fortunate to live so close to cycling heaven – the only way to reach high altitudes around a very flat New York City is by elevator, helicopter or plane. Great, thanks for that link. Feel free to drop me an email if you need more specific route questions answered as your trip approaches.